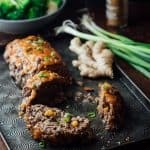 5 Spice Meatloaf with Apricot Ginger Glaze is a make over of an old classic that’s a delicious kid friendly comfort food dinner! Heat avocado oil in a large skillet over medium- high heat. Add onion, bell pepper garlic and salt and cook, stirring often until the vegetables are softened, 3 to 5 minutes. Transfer to a large bowl and let cool 20 minutes. Process bread in a food processor fitted with a steel blade attachment until it forms rough crumbs. Add the breadcrumb, scallions, sesame oil and spice to the bowl with the vegetables and stir to combine. Add turkey or beef and egg to the bowl. Gently knead with clean hands until the mixture is fully combined. Pat meatloaf mixture into a long loaf about 12-inches long by 4 ½ inches wide on the prepared baking sheet. 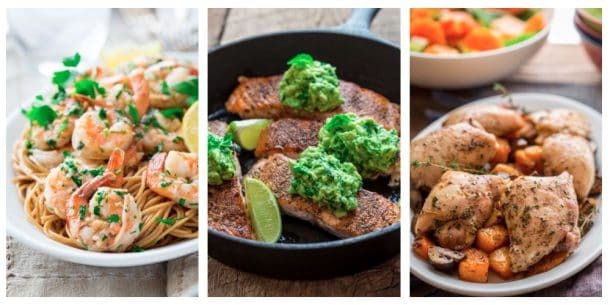 Transfer the sheet pan to the oven and cook, until the top is browned, about 30 minutes. Meanwhile stir jam, ginger and vinegar together in a small bowl. Remove meatloaf from oven, and top with the glaze. Return to the oven and bake until an insta-read thermometer inserted into the venter of the meatloaf reaches 165 degrees F, 12 to 15 minutes. Let rest 10 minutes before slicing and serving.